Recently jilted by his fiancée, David Gray, Earl of Ravenport is not in the market for a wife. Even if Gray didn’t have his hands full renovating his crumbling country house, it would take more than a bold marriage proposal from a headstrong young beauty to thaw his frozen heart. 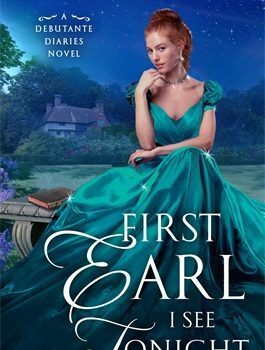 Gray is confident that spending a week at his ramshackle estate will change her mind about marriage, but every passionate moment he spends with her tempts him to change his. 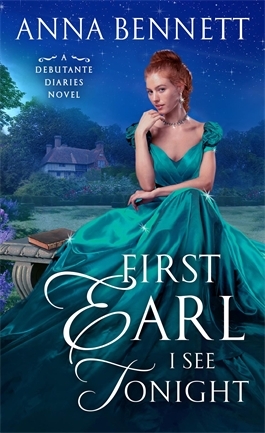 First Earl I See Tonight follows a bold new plot, where our female character takes her future into her own hands. In a time where women were not encouraged to be bold and independent, Fiona takes care of herself. When she finds herself in a position where she is being blackmailed (which at first you think is directed towards her but it is not – it is against her sister), she looks to save herself and her family from disaster. The only problem? Women weren’t in control of their money then. So Fiona devises a plan to get her hands on her dowry to save her sister – the only problem with the plan? She has to convince Gray to marry her and with his current situation between his home and his failed engagement, he has closed his heart to love. While superficial circumstances bring the two together, they slowly come to realize how much alike they truly are. They both put family and friends before themselves and both see the beauty beneath the surface not just the glitter on the outside. Just at they come to realize there could be more than meets the eye, disaster hits – a shock and betrayal that you will never see coming. It leaves you wondering if they can survive this both physically and emotionally and if they can, can they still pull together to form a future. First Earl I See Tonight is a beautiful story of forgiveness, acceptance and hope for the future. While our past may not always be pretty and the present the same, we always have hope for the future and moving to a brighter place. This was a lovely story from start to finish. books with balls, dukes, and gowns were the best. So, when she had the chance to spend a semester in London she packed her bags—and promptly fell in love with the city, its history, and its pubs. She dreamed of writing romance, but somehow ended up a software analyst instead. husband and three children, who try valiantly not to roll their eyes whenever she quotes Jane Austen.